bx_solo [Freeware], Surround Sound/Spatialization Software from Brainworx. 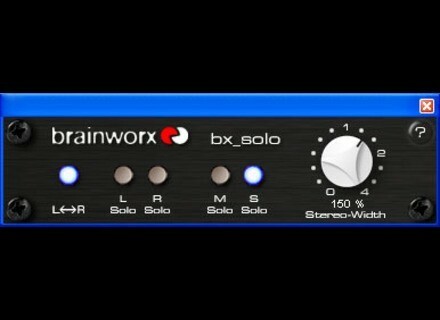 The Brainworx BX Solo plug-in is a free one that is based around M/S technique. You are supposed to be able to use this plug-in for mixing or mastering, but I've only used it for mixing small projects and messing around. Essentially, the plug-in can give you a wider stereo spread for your mixes. The plug-in can be found as a free download on Brainworx's website and is available for both Mac and PC systems. I'm not sure on all of the different plug-in formats that it's available for, but I'm currently running the RTAS version of it in Pro Tools LE. The whole process of downloading and installing the plug-in won't take you very long, as I had the plug-in going in my DAW quite quickly after downloading it. Using the plug-in isn't too hard at all, as it's pretty self explantory. Basically, you've got a knob for setting the stereo width, and then buttons for listening to different parts of the stereo spread, including for L/R and M/S. I haven't ever seen a manual for this plug-in, nor will I ever have the need to seek one out. Right now I'm running the Brainworx BX Solo plug-in on a Mac Book Pro that has a 2.2 Ghz Intel Core 2 Duo processor and 4 GB of RAM to work with. As I stated before, I run the RTAS version of this plug-in in Pro Tools LE 8 that I run with a Digi 002R audio interface. I've only ever used this plug-in on the master fader, so I haven't exactly tried to max out the performance on this plug-in. However, if you use it for what it is meant to be used for, you should most likely be using it in the same capacity. I've been running this plug-in for about a year or two.